People assume that Aluminum or Steel is the best way to make Chiavari chairs because "Metal" sounds strong and solid, so "Metal" must be reliable. But in reality, most of the Metal Chiavari Chairs that we have tested fail BIFMA because manufactures put in the time and the money it don't to takes correctly the weld chairs. They instead use a very simple spot weld to hold the chair together and the welding materials are typically inferior. Cutting Corners with Welding is part of the reason why other companies can sell their chairs so cheaply. But the cheap spot welds are not reliable for long term use. We have tested some Aluminum Chiavari Chairs that broke only 3% into the BIFMA Chair back Durability test. This Aluminum chair would have been a bad purchase for anyone looking for a for a very quality investment. Some people say that Resin Chiavari Chairs are best. But many Resin Chiavari Chairs are brittle and crack easily because, are manufactured using recycled resin. Recycled Resin Sounds and the basic structure of the resin is broken down during the recycling process making the final product brittle and prone to breakage. Also, Resin Chiavari Chair manufactures often use adjunct, filler materials like talc to produce their resin. This further reduces the amount of flex that, the frame has and the without any flexibility chairs are to break. The finish of Resin Chiavari Chairs also proves to be problematic. If a Resin chair is cracked or scratched it is nearly impossible to repair the issue. 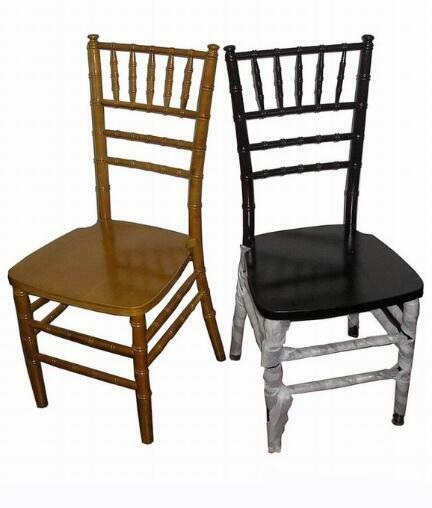 And recently more, more and more Resin Chiavari Chair manufactures are cutting and corners painting their of resin, chairs, and the instead in the impregnating. Paint does not adhere to resin very the chair's paint scratches and flakes easily. Leaving you with a chair that is very difficult to maintain. When is comes to the Chiavari Chair Market, the truth of the matter is that thoughtful design, responsible manufacturing and high quality raw materials are the key to making a strong and durable Chair. VF Furniture uses only premium lumber and our BIFMA results speak for themselves. No other company can say that their Chiavari Chair passes all 6 BIFMA furniture testing.